According to a new report North America Unified Threat Management Market, the market is expected to attain a market size of $2.4 billion by 2022, growing at a CAGR of 9.8% during the forecast period. Unified Threat Management (UTM) solutions come with wide range of network protection protocols that protect networks from both external and internal threats. UTMs are easily deployable by enterprises and have user friendly architecture. In addition, UTMs are a cost effective solution with a combination of standalone security tools with a single management console; therefore, take less space, save cost and energy consumption. In North America, US dominated the North America Unified Threat Management Market. The Country has registered revenue of USD 942.6 million in 2015. 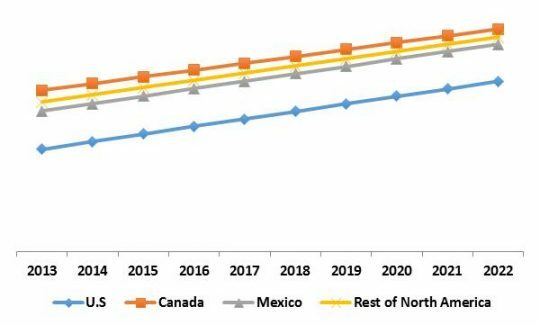 The Canada market is expected to grow at the fastest growth rate of 12.3% CAGR during the forecast period. Large Enterprises dominated the North America Unified Threat Management Market by Organization Size and generated revenue of USD 1,425.7 million. Based on verticals, the North America Unified Threat Management market is divided into government & Utilities, BFSI, Retail, IT & Telecom, Healthcare, Manufacturing, Education and others. BFSI segment dominated the North America Unified Threat Management market. Manufacturing segment would witness highest CAGR of 14.7% during the forecast period (2016-2022). The report has exhaustive quantitative insights providing a clear picture of the market potential in various segments across the countries in each North America region. The key influencing factors of the North America Unified Threat Management market have been discussed in the report along with the elaborated company profiles namely Check Point Software Technologies, IBM Corporation, Cisco Systems, Inc., HP Enterprise Company, Fortinet Inc., Dell Inc. (SonicWall Inc.), Sophos Plc. and Barracuda Networks, Inc.